Photo courtesy of Washington Island Historical Archives. What she was looking at was the magnificent blue limestone boathouse, completed in 1929 for Chicago inventor and millionaire Chester Thordarson. It was meant as just one of the showplaces on the retreat “harmonious with nature” he was developing on the remote little island he purchased in 1910. Instead, it was his final masterpiece. His wife did not share his love for Rock Island, so the grand home he envisioned was never built. Declining health and income were likely the reasons the 100-room hotel he sketched was never begun. 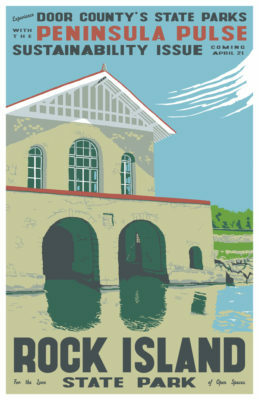 But Thordarson’s boathouse – such a treasure – became his legacy to the people of Wisconsin. 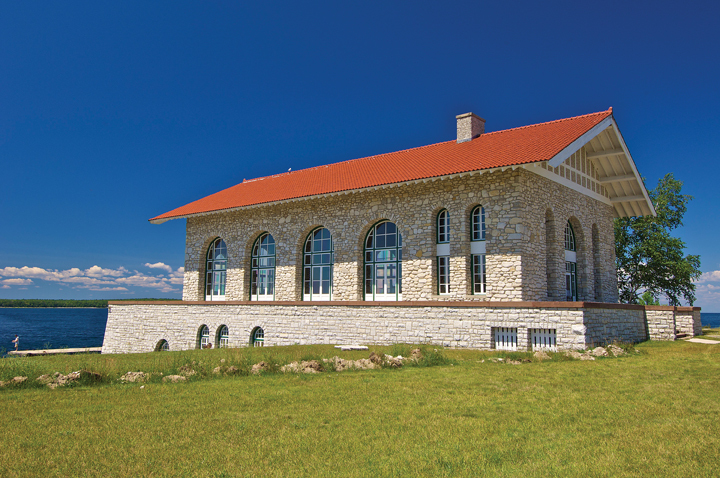 Deemed one of the most historically significant buildings in the state, it is also listed on the National Register of Historic Places. 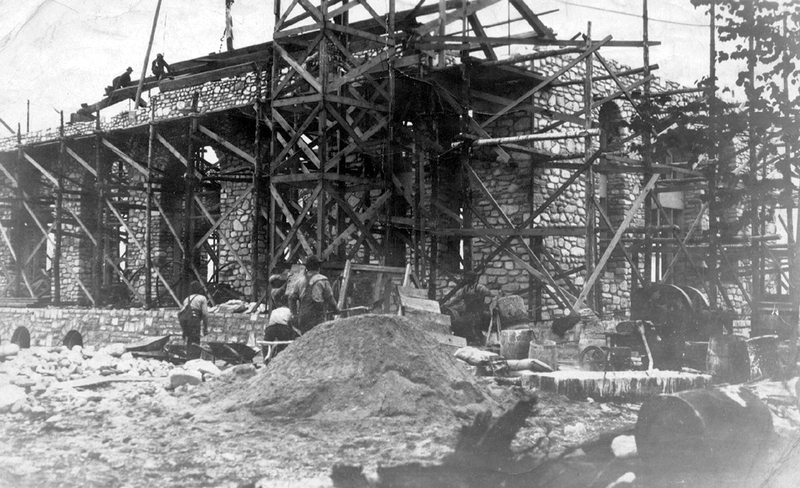 Although Thordarson hired Frederick Dinkelberg, a noted Chicago architect, to design the limestone monolith, he served as his own general contractor. The structure was anchored to bedrock seven feet below the water’s surface. All the stone – in fact, almost all the building materials, except the red tile roof that weighs 50 tons – came from the island. The lower level of the boathouse can accommodate two 50-foot yachts. Atop it, rising 65 feet above the water, is the 40’ x 70’ architectural wonder that Thordarson called his Jewel House of Art and Nature. Referred to by others as Viking Hall, “the casino” or just the boathouse, the massive space is reminiscent of Norse myths. 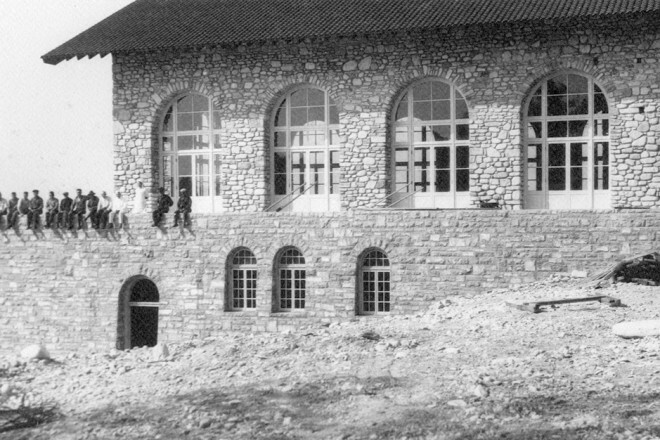 Rows of soaring windows, their arched tops repeating the shape of the boathouse openings below, line three walls. A wide outside balcony overlooks the water and an inside balcony stretches the width of the building. Kirby Foss, who spent 24 years on Rock Island as a park ranger and superintendent, tells a story about the ceiling beams. 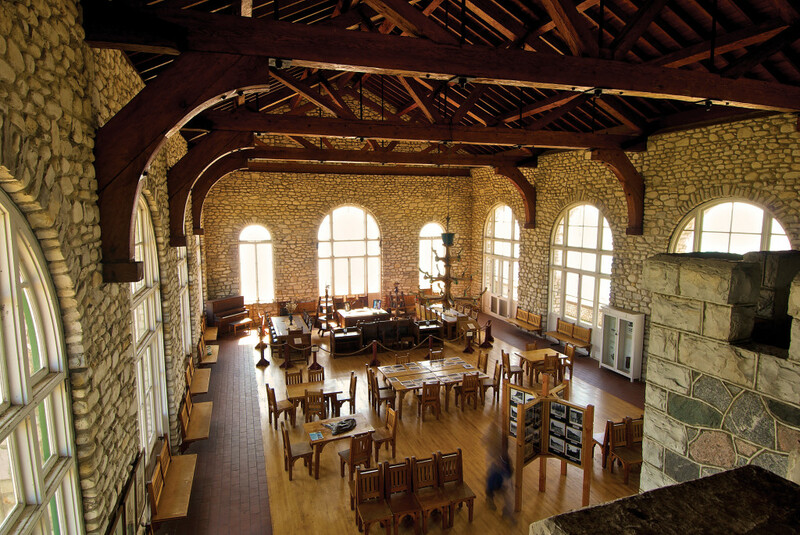 The great room is one of the county’s most beautiful spaces. Photo by Len Villano. To create the unique furnishings he pictured for the great hall, Thordarson brought 29-year-old Halldór Einarsson from Iceland. Over several years, he built and carved many ornate oak pieces, including two huge tables, 20 straight-back chairs, king’s and queen’s chairs, a desk and chair set, a settee and a dictionary stand. Each piece was elaborately decorated with scenes from Norse mythology. The 1999 book, Valhalla in America: Norse Myths in Wood at Rock Island State Park, Wisconsin, by Douglas and Sharon Rossman, pictures each of the items with its runic title and tells the story the mythic scene depicts. The primary reason Thordarson built the boathouse was not to house boats, but to provide a secure home for his vast and valuable library. As a young man, earning $4 a week in a factory, he religiously saved $1 toward the purchase of books. After the invention of the first million-volt transformer and other inventions that made him wealthy, he acquired a library of 11,000 rare volumes devoted to Icelandic history, botany, natural history and ornithology. His collection included: one of only two known copies of William Copland’s The Craft of Grafting and Planting of Trees from 1560; the only known copy of A Boke of the Propertyes of Herbes, printed in 1540; and a 1564 copy of H. Baker’s The Wellspring of Sciences (older by 10 years than the copy in the British Museum). Of special value were his Coverdale Bible and four Audubon folios. In 2010, a similar Audubon set was sold at Sotheby’s in London for approximately $11.5 million. All of them were displayed in cases lining the balcony of the boathouse. 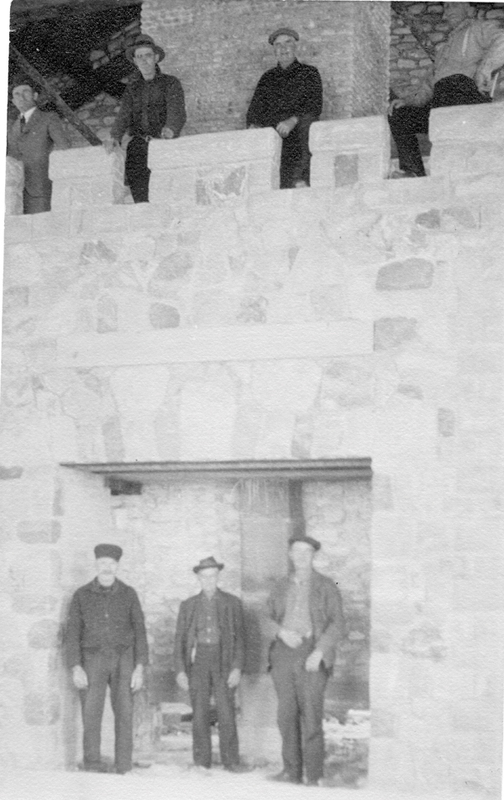 Photo courtesy of the Washington Island Historical Archives. Thordarson died in 1945 at age 77. Although Yale had offered him an honorary doctorate in exchange for a bequest of the books and the bishop of Iceland’s state church urged him to remember the University of Iceland, his will specified that the trustees of the University of Wisconsin had a one-year option to purchase the library. For the remarkable price of $170,000, they acquired the books in 1946 as the basis of their rare book collection in Madison. 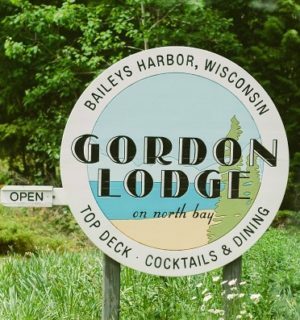 After the state bought the island as a park in 1965, paying $175,000, the furniture was sold to Douglass Cofrin of Shorewood for $50,000. He used it for more than 20 years before donating it to The Clearing, where it was stored until 1991, when Mark Eggelson, then park manager, discovered it and arranged for it to be purchased and returned to the boathouse. The boathouse is open every day during the park season and other times by arrangement with the ranger, when people arrive by private boat. Thordarson’s ashes rested on a shelf in the boathouse for 20 years before they were finally interred on the island. It’s easy to imagine that his spirit still lingers in the structure he loved that ended up costing not $40,000, but between $250,000 and $300,000 – $34 to $41 million in today’s economy!